I serve on the legislature’s Education Committee. I’m sure you’ve read about two bills that would require school districts to consolidate based on number of students enrolled in a particular district, or on overall town population. Regardless of how it’s determined, the state should not be mandating the consolidation of any school districts. Each municipality should have the autonomy to decide if regionalization serves the needs of its taxpayers, parents, and students. Small towns like Canton and Avon are already taking steps to lower costs while still providing the high value education that residents want for their children. Unlike the state budget, which is set and approved by the legislature and governor, town budgets must be approved by the voters. There is an incentive for local Boards of Education to be fiscally responsible, or risk having their budgets rejected at the polls. There are no details yet on what regionalized districts would look like. Would we be forced to build a large regional high school and bus students for upwards of an hour? What would we do in Canton, where the middle school and high school already share one building? What would be the impact to athletics, music programs, and school organizations? What about the important relationships between students and teachers, school counselors, and special education staff? Even if the purpose of consolidating districts is not to disband the districts that already exist, but instead force districts to share the services of one superintendent, one business manager, one director of special education, etc., research has shown that regional districts do not always see significant cost savings. Local boards of education and boards of finance work hard to contain costs and find savings. A regional school board would not have the oversight of a board of finance, and parents and taxpayers would see their level of input into the district’s policies, curriculum, programming, and facilities diminished. Forced consolidation could have far reaching effects on our communities. It’s no secret that property values have dropped in our district. Canton and Avon’s award-wining schools are one of the key elements that draw people to move here, or to choose to stay. 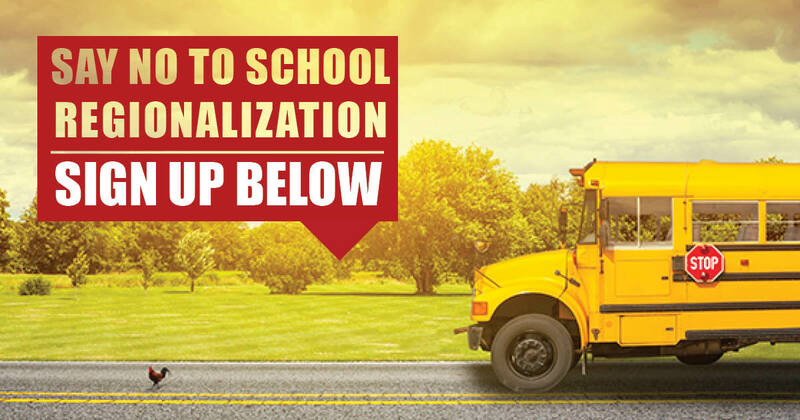 Forced school regionalization would have a negative impact on property values which we simply cannot afford. If these bills do come before the Education committee, I will strongly oppose them. I am willing to have a discussion with the local boards of education about how the state can help with optional consolidation efforts, but we cannot afford another unfunded mandate. Our children deserve better. If you have questions about forced school district consolidation, please contact my office.